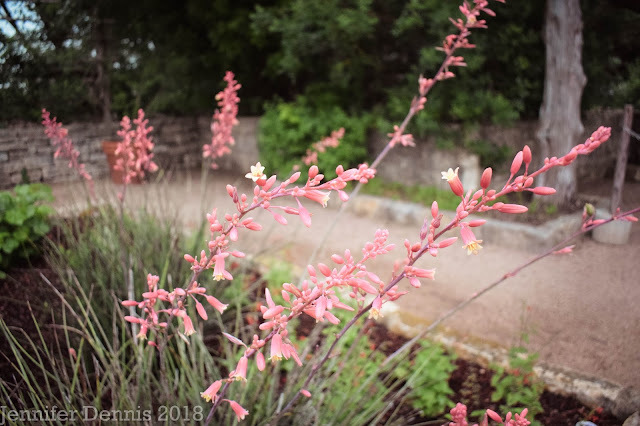 This is my first post from a recent trip to Austin, Texas, for the 10th annual Garden Blogger's Fling. 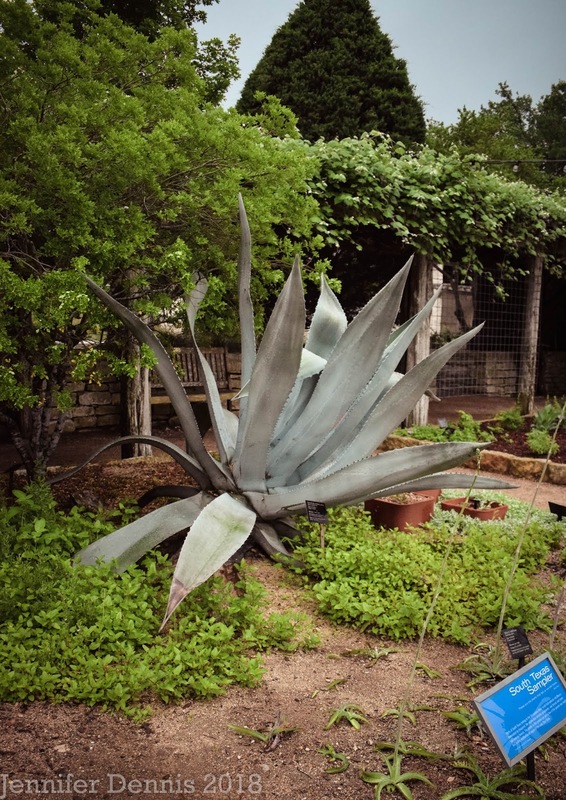 Over 90 plant geeks from North America and around the world, converged on Austin to tour public and private gardens. It's pure bliss for those of us who love talking to other people who also love plants as much as we do. The Flings are hosted by volunteers in a city and/or regional area. The man hours involved are too great to count. My sincere appreciation to the bloggers of the greater Austin, TX area, for putting on an exciting weekend with a scale and variety of gardens I have not seen before. 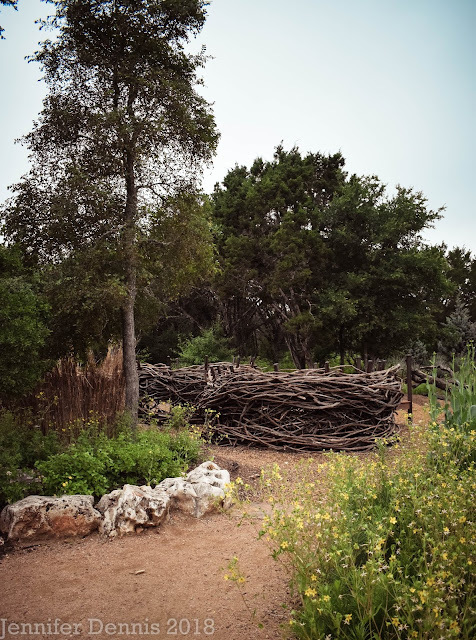 Our first stop Friday morning, was the Lady Bird Johnson Wildflower Center, just outside the city limits of Austin. This was a much anticipated visit for many garden bloggers. The day began with rain in the forecast. As a native Oregonian, I know a thing or two about rain. I wasn't worried about the rain in the forecast and I surely did not need to put on the rain poncho that was given to us in our swag bags. In Oregon, we take pride in the fact that we don't use umbrellas. It's just a bit of moisture after all. I took some pictures after we first arrived. The sky was dark and I could hear rumbles of thunder in the distance. The air was heavy and damp, but the temperatures were relatively mild and so I began to wander, marveling as I meandered at the building architecture, the colors of the native stone and the shape of trees outlined in the distance. The skies began to spit a bit...little drops of rain, nothing to worry about, but as you can see below, ponchos were on. Thunder still rumbled in the distance but I was a bit too warm to wrap plastic around myself. 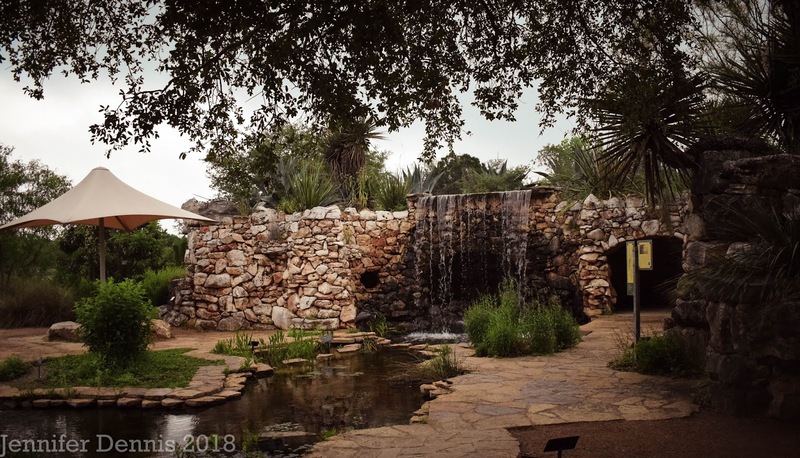 I continued to wandered through the central and themed gardens, stopping to admire a handsome grouping of plants or a pretty pool of water. The Wildflower Center is really a lovely place to admire nature, lose track of time and wander. 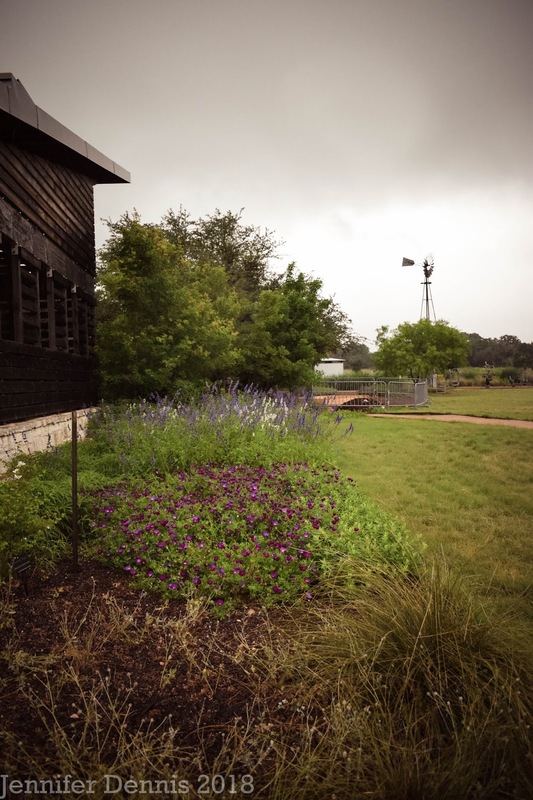 It's significance as a research center for wildflower studies cannot be overstated. A dry garden bed with cane cholla (Cylindropuntia imbricata var. imbricata) in the background. I ventured down some gravel paths, over a long, raised walkway and found myself at the family gardens. Spiral labyrinth with mosaic art spotted along the walls. 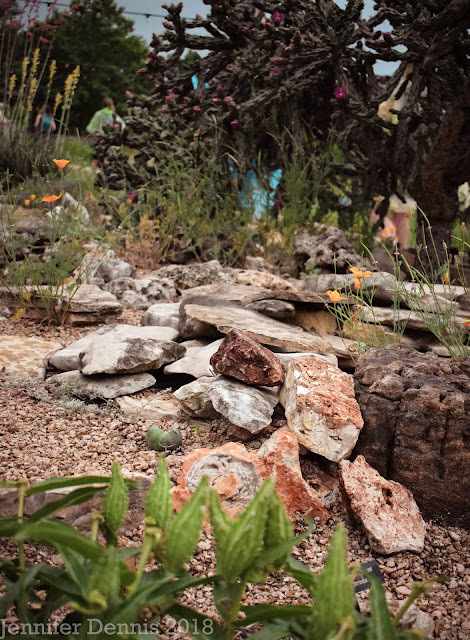 This is the family gardens with wonderful teaching tools to explain nature at it's finest to kids of all ages. What kid wouldn't want to play here? In the next few pictures, you'll notice the sky is getting darker and cloud ceiling has lowered. 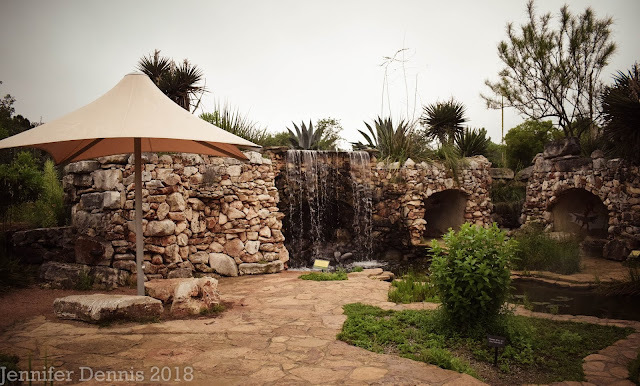 I was nearing the Robb Family Pavilion and was admiring the water catchment system and windmill just beyond. I was just delighted to be in this space. I could hear birds singing in the distance and I saw a few cardinals dashing from tree to tree, but it was otherwise quiet save for a gust of wind rattling the trees. I soaked up the feeling of being in a wide, open space. The rain began to increase and the winds picked up...quite suddenly. I found myself out in the open when thunder and lighting crashed overhead. I ran for the cover of the pavilion, feeling lucky that it wasn't too far away. I tucked my camera in my gear bag and put it in a big zip lock bag that I had brought along, just in case. But, I didn't put my poncho on because I assumed the storm would quickly pass as thunderstorms often do in Oregon. Three other adventurous souls joined me in the pavilion as the rain drops became sheets of water and the wind lashed, bending smaller trees in half. Lightning flashed continuously and the boom of thunder over head shook us all. We could see the pathways beginning to flood and one brave soul checked her weather radar app on her phone and showed us that the worst had not yet come and was moving in quickly. The four of us readied ourselves and made a leaping, mad-dash out of the pavilion, running through inches of water on the flooding pathways, desperate to reach the main buildings. To say 'I got soaked' would be an understatement. We were in the middle of a real Texas Gully-Washer! We reached the side of a stone building, but could not find a door or a covered shelter. There were some steps but it was not clear where they went, so we huddled and tried to determine, through the downpour, which way to go next. On the top of the steps stood a smartly dressed woman, clinging to an umbrella, beckoning us to follow her. We complied and up the steps and around a corner into the building she went. We found ourselves, looking every bit the part of soaked, weary travelers inside the volunteer offices. They took pity on us and volunteer assistant, Frances Cushing gathered up the fixings for a new pot of coffee. We were told to sit despite our pleas of ruining the chairs with our rather wet selves. Nonsense. 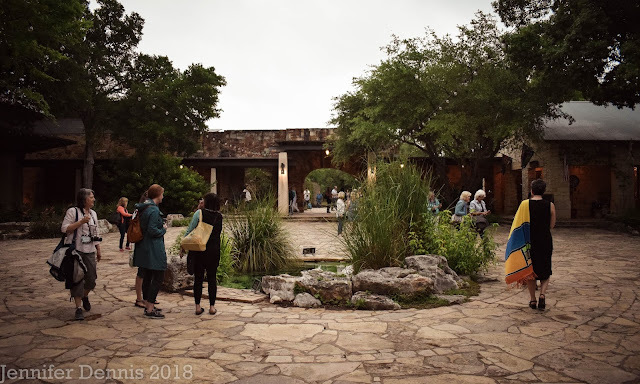 So, we sat and enjoyed a cup of strong coffee while another volunteer, Mary Anne Baker, opened up a map of the wildflower center and began to give us a verbal tour of the center. She shared the history of the development, land acquisition and construction of the center. This gave context to stories I had heard about the controversy of nearby housing developments on top of the limestone encased aquifer during the time of construction. She explained that different buildings were built in the honor of the architectural style of the different waves of immigrants who came to Texas. Some buildings were built with stones roughly carved and stacked in the way the Mexican immigrants and their laborers would have built buildings. 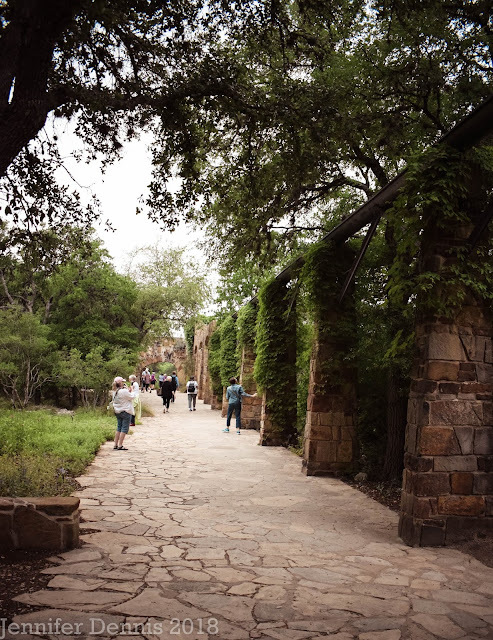 In another area, the stones would be more skillfully carved and laid as the wave of German immigrants would have worked the stones having brought their cutting tools and knowledge with them when they settled in Texas. Each style was so artfully displayed around the center. It was such a surprise to be comfortably chatting away with staff and sipping coffee (all the while leaving an ever growing puddle on the carpet) after our mad dash to shelter. The storm continued to batter away and leaks developed in the ceiling of the room, but it was clearly not too worrisome, as staff moved garbage cans to collect the little rivers from the ceiling without much fuss. I daresay, I experienced Texas hospitality first hand. We checked the time and after expressing our appreciation of the warm room and coffee, loaded up our wet things and made a run for the gift shop where the other 90 or so in our party had congregated. And yes, I put my poncho on. This Rainy Day Gardener learned her lesson. Here are links to two other garden bloggers perspective on our visit to the Wildflower Center. 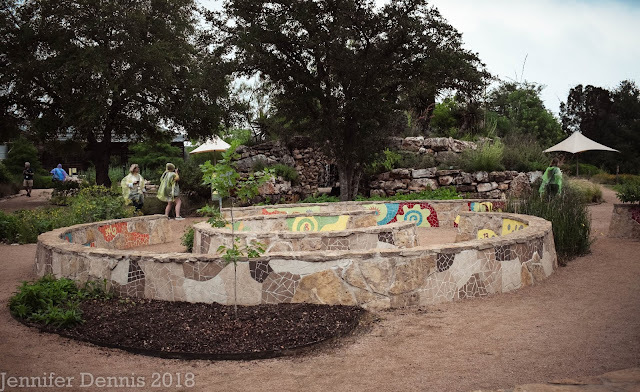 Both are well written and chalk full of great information about the Wildflower Center. I'll write more posts on the Austin Fling as I wade through my photographs. Stay tuned! Hey Pam, I hope to get back to Austin someday and visit again..sans thunderstorm. But I will tell you, this spot had to be one of my favorites because I really do love crazy weather (we get very little interesting weather in Oregon) and then to have had time with the centers volunteers, to listen to their stories and get a lovely verbal tour of the center was wonderful! Janet, I really enjoyed chatting with you in the back of the bus, you are a riot! What fun memories we'll have thinking back on this trip. Till next time!! This is absolutely wonderful! 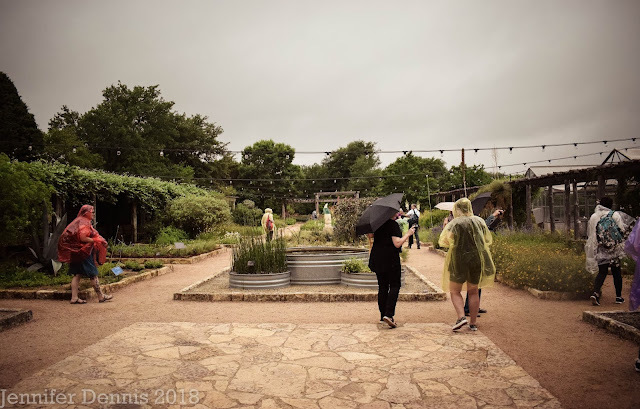 You really got to experience the Wildflower Center. I'm still laughing that Oregonians don't bother with umbrellas--you rock! Thanks Linda...it's true, we native Oregonians are a bit snobby about our rain gear. A stout jacket with hood that performs is what the rain doctor prescribes! I finally found your Blog again ! See you at the swap I hope . I'm so sorry I missed the Ladybird Johnson Wildflower Center! (Though not sorry about missing the storm.) The last time we were in Austin was over Christmas a few years ago and the center was closed. I heard several people say something about how us "Pacific NWesterners know all about rain" and I had to correct them, our rain is nothing like that rain, thank god! What a nice stop for you on the way back to the gift shop. I would love to know what their sales were that morning. I bet record setting with most of us shopping. Ha! 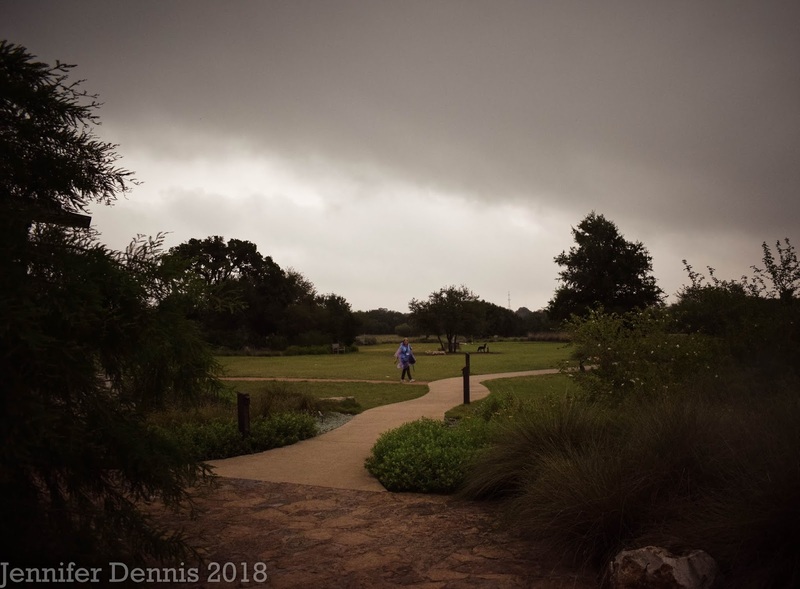 Even though rain has become relatively uncommon in Southern California, I wasn't too worried about the forecast or the clouds when we started out either. I hadn't brought the hooded jacket I'd worn on the plane flight and, assuming my umbrella would be adequate, didn't bother donning the poncho until much too late. I was sodden for the entire day. Texas weather demands respect it seems! I haven't waded (pun intended) through my photos yet but I'm impressed by yours. That photo of the ominous gray sky says a lot! I love this story, Jenni. How wonderful to have bonded with your group of four and to be warmed with drink and tales from Center volunteers. What an adventure!